Projects like the Burlington 2030 District not only fit with our area of knowledge and experience, but they also align with our mission, which is to “improve the way buildings work for people and planet through engineering and consulting that bridges design, construction, operation, & policy.” Our engineering work not only makes buildings work better and improves occupant comfort, but also reduces carbon emissions and pollution. 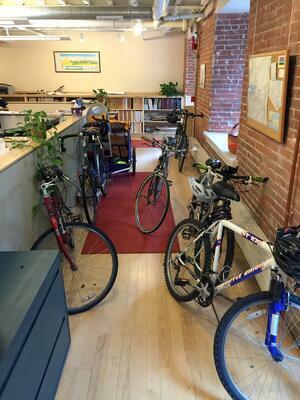 Typical Day in the Office - The Cx Associates "parking lot"
Because actively working to slow climate change through energy efficiency is integral to our mission, we’ve discussed ways to expand Cx Associates’ internal carbon reduction strategy to bring us closer to carbon neutrality. Currently we have a suite of green incentives to encourage our employees to commute to work in a more environmentally friendly way, including free bus passes and incentives aimed at cyclists and walkers. One of our engineers rides an electric bicycle to and from work, complete with seats for his children. Three others routinely walk or ride the bus to work. As an office, we also work to reduce waste by composting, recycling, and purchasing recycled products. You might enter our doors and find a part of our offices in relative darkness, due to the lights being off because the staff are at a site visit. We use rechargeable batteries, and so on. The business approach that has led us to implement initiatives such as the green incentives program is one of applying the triple bottom line of profitability, sustainability, and workability (i.e., promoting a healthy work/life balance). Often the triple bottom line is applied to decisions as they come up, and just as often it’s woven into policies. This approach has certainly brought us to a good place, and we believe its application has reduced our carbon footprint. However, as engineers we understand the importance of verifying that something is actually working, and we know that you can’t manage what you haven’t measured. 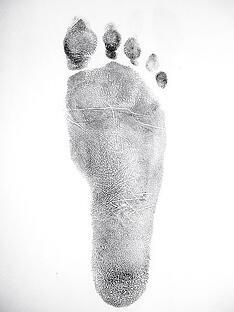 So, we have discussed taking on the daunting and time-consuming task of calculating our carbon footprint. This would establish a baseline of material emitters, such as driving, flying, powering electronic devices, heating, and many others, with which to assess our progress as we implement action to further reduce our carbon impact. How To Begin and Which Tools to Use? If we do engage in carbon accounting, the question to begin with is, how far down the rabbit hole do we want to go? We could do a “quick” calculation based on easily obtainable numbers, such as our utility bills and the distance our employees drive to work. We could access an on-line calculator, such as CoolClimate Network’s Small Business Calculator, to estimate our emissions using simplified, predetermined inputs. Or, we could take a methodical and thorough greenhouse gas inventory by delving into the Greenhouse Gas Protocol. The Greenhouse Gas Protocol is the international standard for accounting tools used by nearly every standard in the country, such as the Climate Registry. With the protocol’s guidance, we’d look into every corner of our business, identify which measures are essential for accuracy and determine how to gather the data. Once a measurement strategy is developed, we’d need to identify a carbon calculator tool from dozens of products, into which we’d input the emissions and generate a bottom-line number. The objective, no matter how comprehensive our calculations, would be to come up with methods of further reducing the final number. A considerable effort goes into fairly and accurately developing a carbon footprint, and anyone involved will devote many hours to the task. Whether taking on this substantial task promotes the triple bottom line balance and, therefore, makes sense for our small company remains to be seen. If doing the work will help Cx Associates live up to its mission and vision and will help us provide better services to our customers, I think it’s worth it. Has your small business completed a carbon footprint analysis? We’d love to hear from you.